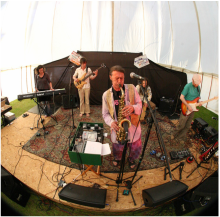 The Cactus Room are a five piece that refuse to be pigeon holed except to say they make you want to dance – reggae, funk and ska grooves overlaid with rock, blues, dub, jazz, pop and folk roots influences. With a full 2hrs of vibrant, rich original material ranging from chill-out to pumping psychedelic workouts they can adapt their set for a variety of stages. Teds alto sax varies from soulful and magical to screeching, growling rawness. His poetic spoken word adding positive eco and social comment, augmented by harmonies from Deb and Simon with Simon taking over lead vocal on a couple of tunes. Neil’s agile, intelligent fretwork contributes the most variety on both rhythm and lead, you lose track of his references to top players, bands and styles as he changes gear from subtle and restrained to blistering over-driven speed king. Deb, Simon and Mick Form the backbone creating loose infectious rhythms Deb has a gorgeous touch on keys with weaving grooves and fills. Simons bass providing a hypnotic deep pulsating underworld and Mick tying it all together with expressive, magnetic beats transforming the cajon into a small drum kit.